Testing requirements and acceptable limits of chemical and microbial contamination varies from compound to compound and can differ based on product type. 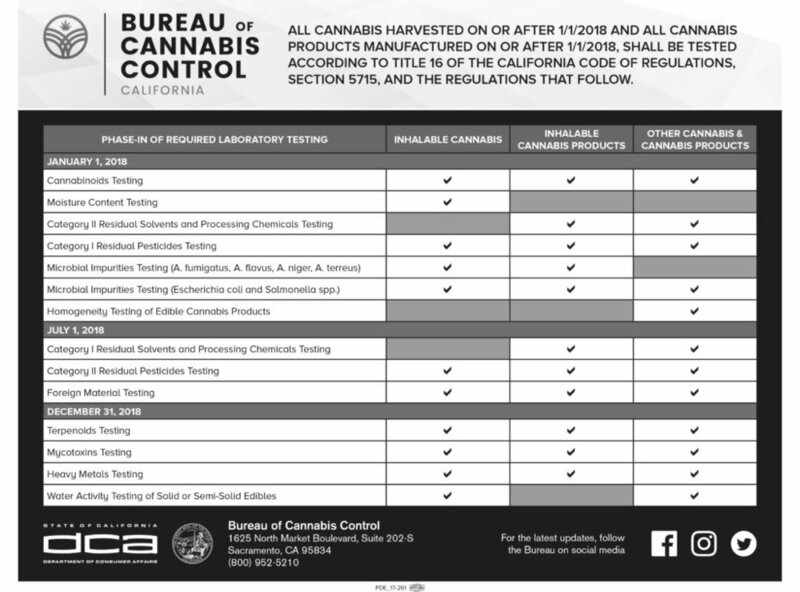 Labs can test for potency, pesticides, microbiology, terpenes, heavy metals and more Certain tests have been required as of January 1st, 2018), with additional requirements added on July 1st, 2018, and the final set become mandatory for all products produced on or after December 31st, 2018. The following chart breaks this down in greater detail. Licensed adult-use and/or medical cannabis distributors are legally required to facilitate compliance testing. Laboratories are required to develop and implement a chain-of-custody protocol to ensure accurate documentation of the transport, handling, storage, and destruction of cannabis samples. After taking physical possession of the batch(es) to be tested, the distributor is responsible for arranging for a laboratory employee to come to the distributor’s licensed premises to select a representative sample for laboratory testing. Only qualified employees from the lab must visit the distribution facility. The distributor is required to store the entirety of the batch (from harvest batches and cannabis product batches to be tested) until testing is done and it passes or fails. The distributor shall ensure that the batch size from which the sample is taken meets the requirements of this division; a batch may be over the size limit of the batch as set by the state, and would need to be split into multiple batches and tested separately. The lab sampler must have access to the entire batch (in an accessible location with no interference allowed) and will select 2 representative samples of the batch - a primary and a field duplicate. An employee of the distributor shall be physically present to observe the laboratory employee obtain the sample of cannabis goods for testing and shall ensure that the increments are taken from throughout the batch. However, the employee shall not assist the laboratory employee nor touch the cannabis goods or the sampling equipment while the laboratory employee is obtaining the sample. Both samples will be tested by the laboratory, but only the data from the primary sample will be reported to the client. The samples will be approximately the same weight (in the case of Cannabis flowers) or same number of units (in the case of pre-packaged Cannabis goods). The sampling shall be video recorded with the batch number stated at the beginning of the video and a visible time and date indication on the video recording footage. The video recordings shall be maintained for 180 days. After the sample has been selected, both the distributor and the laboratory employee shall sign and date the chain of custody form pursuant to section 5709 of the business code, attesting to the sample selection having occurred. The image above, courtesy of CW Analytical, lays out how sampling works on a more granular level. Once testing is complete, labs should destroy the sample unless more tests need to be conducted. A sample “passes” a laboratory test when the sample meets specifications in chapter 6 of the Business and Professions Code. Distributor must obtain a certificate of analysis from the testing lab corresponding to the batch(es) being tested. The label on the cannabis goods is consistent with the certificate of analysis regarding cannabinoid content and contaminants required to be listed by law. Further duties around quality assurance are covered in the Quality Assurance section below. A sample “fails” a laboratory test when the sample does not meet specifications of the Business and Professions Code. If a failed sample was collected from a batch and the batch could be remediated pursuant to section 5727 of the Business and Professions Code, a distributor may transport or arrange for the transportation of the batch to a manufacturer for remediation. A distributor shall destroy a batch that failed laboratory testing and cannot be remediated pursuant to section 5727 of the Business and Professions Code. Please note that there are specific steps licensees can take, such as challenging failed lab tests, that we do not cover here. A distributor shall not package, re-package, label, or re-label manufactured cannabis products except for when the distributor also holds a manufacturing license and is packaging, repackaging, labeling, or re-labeling its own manufactured cannabis products. Notwithstanding subsection (b) of this section, if it is determined during laboratory testing that a manufactured product is labeled with the incorrect amount of THC per package or serving but is within the THC limits for sale, the distributor may re-label the package with the accurate THC amount. All events up to this point will need to be entered into the track and trace system. Licensees must maintain a dedicated quarantine area, take precautions to secure the area, and make cannabis waste “unusable and unrecognizable” before removing it from the premises. Permitted types of non-consumable solid waste for these purposes include paper, plastic, cardboard, food waste, grease or other compostable oil waste, a compost activator, or soil. Cannabis waste must then be labeled with a bill of lading or shipping manifest that indicates product information and weight. Finally, it must be held in the quarantine location for at least 72 hours before being removed from the premises. All of this must be done on camera, and a separate surveillance camera with 30-day archive is required for the quarantine area. The monitor is an employee or contractor for the Bureau. Quality assurance reviews are conducted randomly before product goes out for distribution to ensure that labeling is accurate and packaging conforms to requirements. The QA compliance monitor is to be given access to all records and test results of a licensee to conduct their reviews. All inspection records completed by a QA compliance monitor must be turned into the bureau. The QA monitor is also be responsible for verifying the accuracy of the tax payments collected under Sections 34011 and 34012 of the Revenue and Tax code. Access to the track and trace inputs and assumptions must be given to the QA compliance monitor, to ensure the accuracy of the data as well as that they match up to the tax payments. All of the aforementioned details do not prohibit a licensee from performing testing on the licensee’s premises for the purposes of quality assurance of the product in conjunction with reasonable business operations. Please note that the testing conducted on the licensee’s premises by the licensee does NOT meet the testing requirements pursuant to this division. Distributors performing these services may collect a fee from the licensee for the services provided, in the case of an arms length transaction. The fee may include, but is not limited to, the costs incurred for laboratory testing. A distributor may also collect applicable state or local taxes and fees. With the stricter monitoring of cannabis, consumers can feel more secure in buying products available on the market. This vast shift in regulations will increase the standards of all businesses, resulting in higher quality products. Companies that do not yet comply with the new rules must quickly organize to fit the new market policies so as not to risk losing their licenses and ultimately their market share in this burgeoning space.